The “King of Freshwater”, “The Freshwater Shark”, “The Waterwolf” different names in different areas, but they all mean one thing big, mean, and nasty. The mighty muskie is freshwaters fiercest creature, boasting world record proportions of almost seventy pounds, over 63 inches in length they are a most unpredictable species. The thrill of the hunt, searching for and locating these marvelous fish, then finessing an active predator until it follows your lure, smashing into the bait as it changes direction during a figure eight. With one foot of line out and a fish shaking its head like a giant tarpon you just grit your teeth as she leaps into the air trying desperately in one last acrobatic attempt to shake the lure that holds her. With the “King of Freshwater” thrashing and splashing as it fights it’s way to the boat, the adrenaline starts to flow through your body. A couple of leaps out of the water and the excitement level intensifies. With the rod bent in half your only focus is on landing that trophy. A few moments later your guide removes this large predator from the net and exposes it’s massive jaws, numerous large teeth, and vast determination to escape. Your smile is full of adrenaline and achievement. That’s what this elusive freshwater sportfish is about, so join the country’s fastest growing fishing adventure, MUSKY HUNTING! Realizing the hours of dedication it takes to put a 20 or 30 pound musky in the boat, you wonder will it ever happen to you. 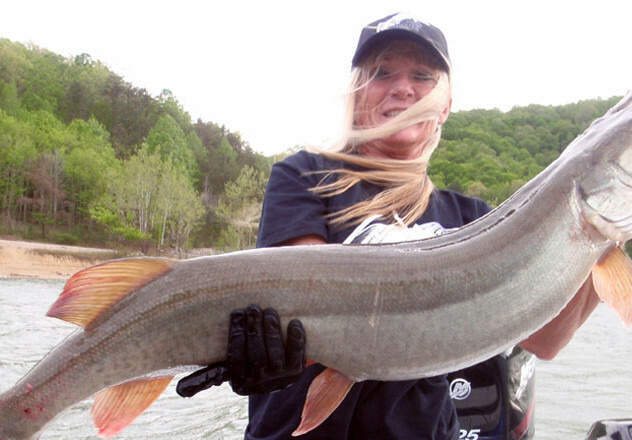 At Cave Run Muskie Guide Service Inc. we have put in the pre-fishing hours for you! Our guides are on the water over one hundred hours per week targeting the mighty musky. Our guides have located that big once in a lifetime fish for the veteran muskie nut and many smaller fish for the beginner after the first legal. 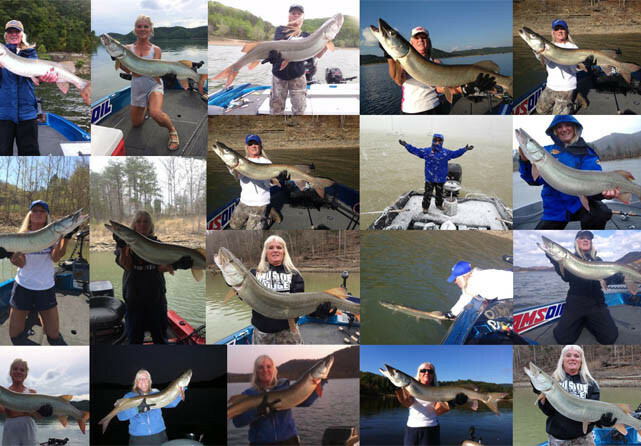 Cave Run is the largest southernmost reservoir containing native and stocked muskellunge and with a year-round season the freshwater king can be captured anytime. September 21st will be a day that I will always remember, foggy, cool, and breezy on the water muskie fishing. My clients this memorable day were Jim and Terry Walters from Muskegon Mi which I had meet while doing a seminar at Michigan Musky Hunters Club banquet, they were very eager to learn about Cave Run Lake and it’s muskie fishing, the newlyweds were new to the sport and ready to go which always gets me fired up. I had been moving muskies and been told of muskies caught in the area called “The Flats” for several days, a very common spot for muskie anglers at this time of year. The previous day we had raised a large fish from this area, after reviewing my records comparing conditions I made the decision to go there and work the shallower weeds first till the sun got high. But as we drove up Beaver Creek I noticed wind pounding into a spot on the Licking River that I love to throw TopRaiders and Triklops under lowlight conditions during this time of year, so a quick decision and swift turn of the my Ranger put us on the spot. After 20 or so cast into that small bay I headed out to my original destination on the main lake. So then came lure decision time, a natural Deucetail had given me many good fish over the past few years and the water looked good for it on this day, yet several anglers had told me of black and copper success with bucktails in the previous days. 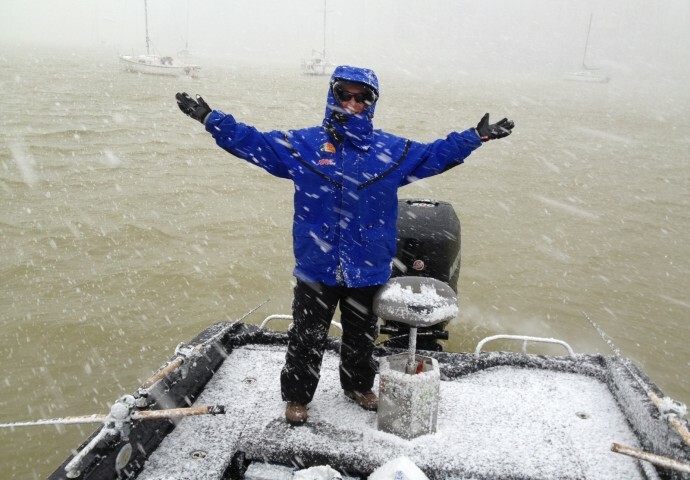 With fog still hanging fairly low, I pulled from my Plano box a TopRaider for Terry and the natural Deucetail for Jim; we jumped in line with a number of anglers to drift the flat. Third cast up on the flats with the Deucetail and Jim has a four- footer or better just explode at boatside just before the first inside buoy on the Zilpo side. As our drift continued a few 100 yards I decided to get out my Lamiglas TI200 Titanium rod and loaded with Power Pro small diameter 80 lb line and tipped it with a black Grim Reaper 1 oz spinner with gold flake and double willow blades (Doug says that I am the only one that orders these baits with the double willows here locally) and throw the home run cast to the opposite side of the boat. Hoping of hooking a fish to hand off to Terry with the intent of encountering her first muskie, which I do a lot with first timers by covering lots of water with long casts. As my bait hit the water, before I made a turn of the handle, I felt a strong tug to my line, I set the hook and out came this monstrous fish completely out of the water. I had never seen a fish of this size ever completely leave the surface to give us an awesome tail walk, then a second later she did it again, what a sight. All thoughts of handing my lightweight rod off to a newcomer to the sport with this beast on the end were gone (not even thinking of a state record). Then came the reality of a pure adrenaline rush as she made a run right at me, my high speed Marado Icon reel came in handy here as I caught back up with her. At this point her mighty jaws came out of the water with a half dozen vicious headshakes, I waited for the lure to fly back at me but my Action Optics helped me see that the Grim Reaper had her hooked with text book style. But then she seemed to have given me all see could as she gently swam closer to the boat, that’s when a flash back of David Christain cursing for a month about his biggest fish ever having the lure pulled from it’s mouth by the net on a clients first net job and then swimming away haunted me. A quick decision had me grab the net myself but then realize that a one handed net job on a fish of this size would be dumb and the gratification of having Terry feel the power of the mighty muskie made the decision easier. So I instructed Terry to take the rod, keep the line tight and Terry lead the fish, feeling a couple of awesome tugs as I easy scooped her into my Frabill and she was mine. I quickly cut the hooks and brought her up for a photo, that’s when I felt the weight, I knew that I had never had a fish this heavy before. She didn’t look as long as she was I guess because of her girth. A few photos, measurement and she was in my Ranger’s livewell, I quickly girthed her in the livewell at 23.5 x 54.5. With my cell phone handy and without a calculator I called the most knowledgeable guy I know Steve Heiting at Musky Hunter, the formula had her at nearly 40 pounds. I gave her 15 minutes and let her go and she swam off fine for about 30 feet then bellied up. I retrieved her and again put her in the livewell with a little ice hoping to help revive her. We fished for 20 minutes or so and tried her again only to find her immediately rolling, once again she went back to the livewell. While in the livewell she wouldn’t hold herself up and after 10 minutes of forcing her from rolling I decided to put her back in the water, which would be the last time. After all the work this fat boy was wore out from lugging her up and down and hanging off the side of the boat holding her upright. Again she wouldn’t go and being from the south where the heat effects them so bad I knew from experience that she was done, I pulled her up for some more photos and measurements. Only to find that her girth was 25.5 not 23.5, Later a pictured taken while girthing her inside the livewell showed that the tape was not in the fat of the body. David Christain and my client did a quick head calculation and advised me to get her to certified scales. So back to the dock we went where I had left my digital scales from my trip to the PMTT at Minnetonka, WOW 46.8. 4 hours after her capture, I called the Dept. of Fish and Wildlife told them of the accounts of the fish and ask whom the potential record should be credited to since she touched the rod while landing. They informed me that the person who cast, hooked and fought the fish would be credited with the fish. They then instructed me to Lew Korman, their area biologist in charge of the muskie-stocking program who told me to go to certified scales; this is when my excitement turned to frustration. After driving 25 miles making 5 stops and making 20 phone calls we finally found scales at Caudill Seed Co, miles outside of Morehead. By this time my beautiful fish had a sunken in belly and looked very scrawny as I hung her over my back as we walked through this large warehouse to the area of the scales. My wife Jessica said it look like the old picture you see with anglers carrying large muskies over their shoulder, Employees of the seed company determined her weight at 44.75 lbs and Mr. Korman inspected the fish, verified it’s weight, the scales themselves and gave me my signed certification to be sent to Frankfort. Why is it that the Muskie Capitol of the south has NO certified scales anywhere near the lake even at the fish hatchery seems thoughtless, I hope the tourism commission learns from this one and invest in a couple of sets to be placed at the two marinas so no one kills a potential record just to get it weighed. Because I don’t believe that this record will stand very long due to the amount of big fish seen and caught and released on the CAVE lately. Mr Korman also added that this fish was of the same stocking that Scott Flatts record fish was from back in 1989, he added that this fish was probably in its last years of life, yet I wish she could have lived to spawn again because she was truly a mighty muskie. Well this was just the beginning of a wonderful day as the reality of taking a record fish started setting in. In fact I woke up the next morning thinking I had dreamed that I caught the state record. I would like to thank first Jim and Terry Walters for their help and patients as the days event somewhat spoiled the remainder of the days fishing, also I would like to thank all of my sponsors that were very excited for me. Lastly I would like to give a special thank you to all of the friends, clients and people from the muskie industry that congratulated me, that feeling can’t be duplicated. 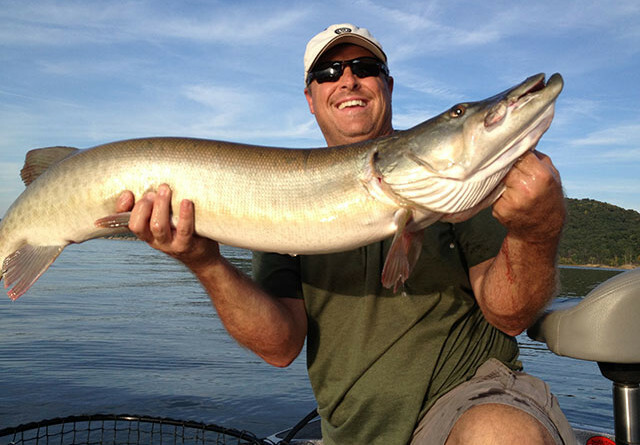 Tony Grant operates Cave Run Muskie Guide Service and is the owner of Mountain Muskie Lodge on Cave Run Lake. He also is the Manufacturer of quality muskie lures including the Producer Series Rattlin’ Shad. 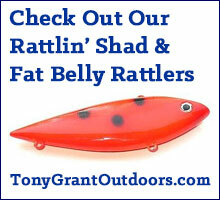 To contact Tony you can e-mail him at tonygrantoutdoors@gmail.com or phone him at (606) 776-6567.